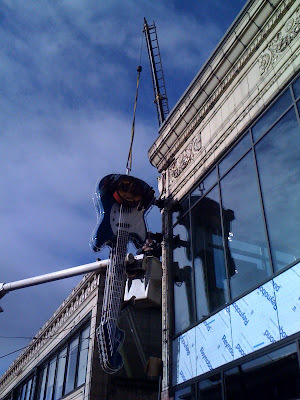 On Monday, Hard Rock installed one of its iconic guitars on the exterior of the Liberty Building . This guitar is unique in that it replicates the Fender Mustang guitar that the late Seattleite Kurt Cobain plays in Nirvana's famous "Smells Like Teen Spirit" music video. 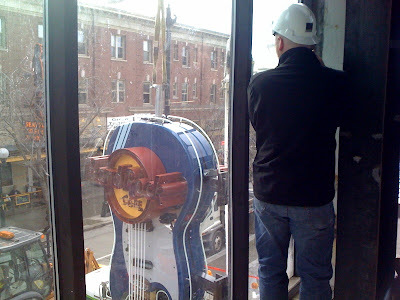 Photos of the install are below. Though Hard Rock has not yet announced an official opening date, Hard Rocks' Facebook page claims that the opening will occur 'sooner than anticipated'. With talk of an early February start date, it's only a matter of days before they unveil their new LEED Silver location. 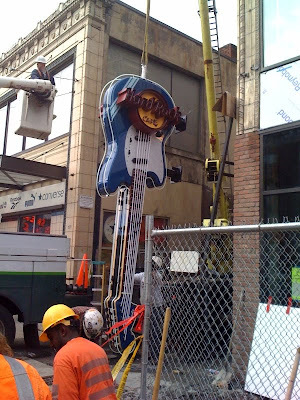 Get ready to rock, Seattle.